I loved the main character of Libby so I can't wait to read about her again as the series progresses. She is literally your girl next door and someone who we can all relate to. She is trying to find herself to some extent and she does a really good job of doing that over the course of the novel. I love the fact that she falls into the trap of moving into a flat which turns out to be a bit of a nightmare flat but, like all of us, she has to put up with it because she's now tied into a contract. Of course there is a love interest or two and all sorts of fun ensues because of that. 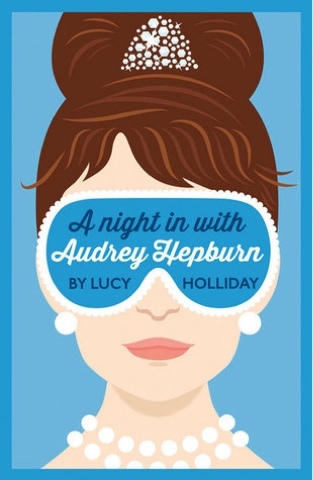 the other man character is the one and only Audrey Hepburn and I had great fun reading about her-the book must have been so much fun to research and this read inspired me to watch a couple of Audrey films myself! Libby's family also plays a big part in the novel and she doesn't have the best relationship with them, I liked the fact that Lucy Holliday wrote about this because people sometimes don't have that family support there and have to strike out on their own, but Libby still has a loyaty to them which i thought was really sweet. Yes there is an element of magic about this story, someone who starts seeing Audrey Hepburn in their flat, there's going to be but I never really found it difficult to believe or hard to grasp the concept, I just liked the fact that Audrey was there for help and advice and like Libby's Nespresso machine-who wouldn't? So you will have to keep an open mind whilst reading this, its a bit like a Christmas Carol or Its a Wonderful life, just keep that in mind and you'll be fine! I am currently reading the next in this series and would really recommend reading them back to back, when they're such quick, fun reads though, that's not a problem. This book comes highly recommended from me, it was a pleasure to read!